Today I received a surprise package in my mail! Of course, I remembered ordering a copy of Penholder’s Everybody’s Letter Writer: being a Complete Guide to Letter Writing, but the website (abebooks.com) had told me that it would take 10 to 14 business days. Apparently they can also do it in three. 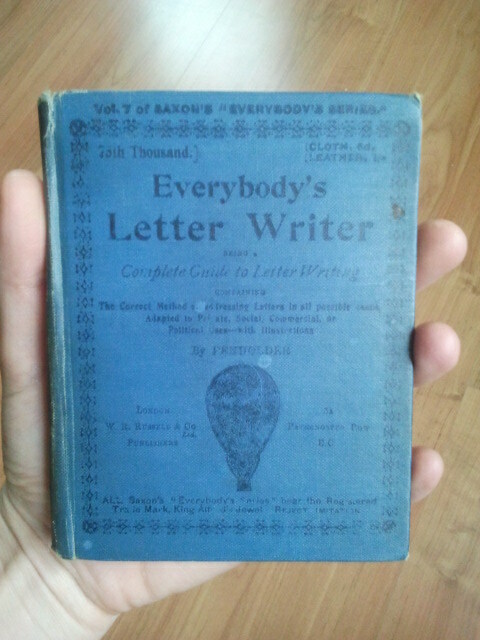 Penholder’s book is the cutest little thing, shaken from spine and with sunned interior. It has this great smell of old books about it, and this became immediately apparent when I opened the envelope. According to abebooks, the estimated publishing date of this particular book is 1893. However, in one of the advertisements in the front of the book there is a short note from someone who claims that Eade’s Pills have saved his life (“They are a Most Wonderful Medicine”), which was dated Jan. 24th, 1898. 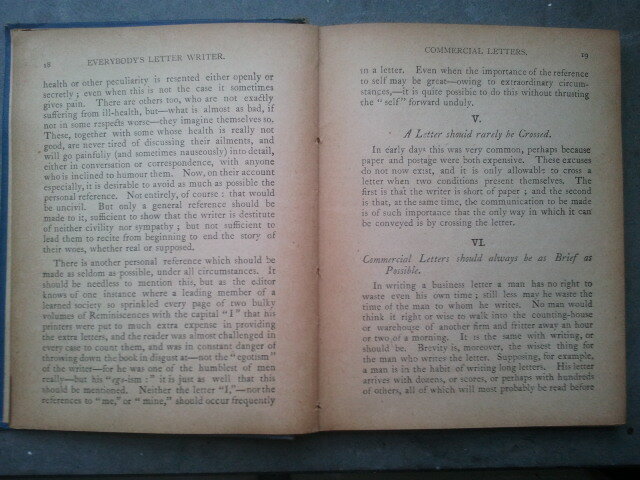 S/he continues in explaining that there are only two reasons for someone to cross a letter: when the writer is short of paper, or when – at the same time – the communication is too important to wait. 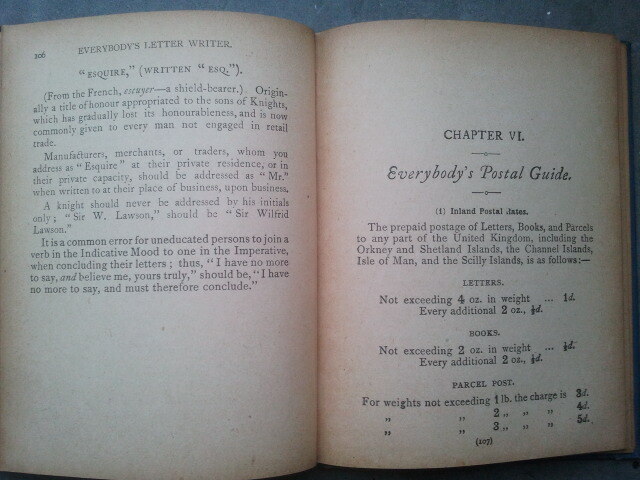 The book also spends a chapter called “Everybody’s Postal Guide” (21 pages) on explaining how the postal system works, and how much must be paid for different types of letters, packages, telegrams, etc. This elaborate guide really seems to be a complete guide to all you would and could ever want to know about the costs of sending items however small or large. I am very happy with my book, and would like to thank Dr. María F. García-Bermejo Giner from the University of Salamanca once again for the help with finding it! Gallery | This entry was posted in 19th-century letters, letter writing and tagged 19th century advertisments, crossing, Letter writing manuals, Penholder, postal guide. Bookmark the permalink.